It was only a couple of years ago that corticosteroids were in the news after 64 people died of meningitis from contaminated supplies produced by the New England Compounding Center. The current warning is completely unrelated to that outbreak, however. 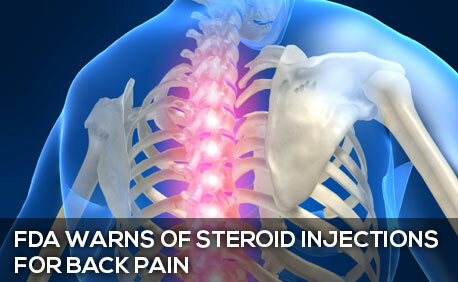 Two other factors have prompted the FDA’s concern and latest announcement: (1) Steroid injections via the transforaminal approach bring a needle within millimeters of critical arteries feeding the spinal cord; and (2) Particulate steroids are slow to dissolve and may create blockages that trigger strokes if accidentally injected into arteries. The Safe Use Initiative is a program of the FDA which solicits input from medical practitioners about the use of various medications. In 2012, they convened a group of experts from anesthesiology, orthopedics, neurology/stroke neuro-radiology, pain medicine, and physical medicine and rehabilitation to create guidelines for best practices for steroid injections administered close to the spinal arteries. They continue to investigate the issue, and the FDA may take further actions in the future. For the many Americans who suffer with back and neck pain, the FDA urges a discussion with healthcare professionals about alternative treatments. A patient who has received an epidural steroid injection (ESI) should seek emergency medical attention immediately if they experience vision changes, tingling in the arms or legs, sudden weakness or numbness, dizziness, severe headache or seizures. Several multimillion-dollar jury verdicts have attempted to compensate men and women who sought treatment for their pain and wound up with life-long disabilities after being given corticosteroids by spinal injection. In 2010, a Florida woman and her husband won a $36 million malpractice verdict when she was partially paralyzed by a botched steroid injection for back pain. A Texas man is nearly blind and in a wheelchair after his treatment; he settled for a confidential sum. A Texas teacher suffered permanent nerve injury and has difficulty with balance, pain and numbness in her legs and feet; her case is still pending in court. If you or someone you love has been harmed by a medical practitioner who administered or prescribed a drug in an off-label use, call the South Carolina medical malpractice lawyers at the Louthian Law Firm at (803) 454-1200. When life goes wrong, we fight for what is right.